Our publication arrived! Searching for the White Cube, an exhibition project I carried out with Sandra Jasper and many many supporters as an initiative from the MinusEins Experimentallabor led my Mischa Kuball from KHM 2013 in Bochum is finally documented and printed. 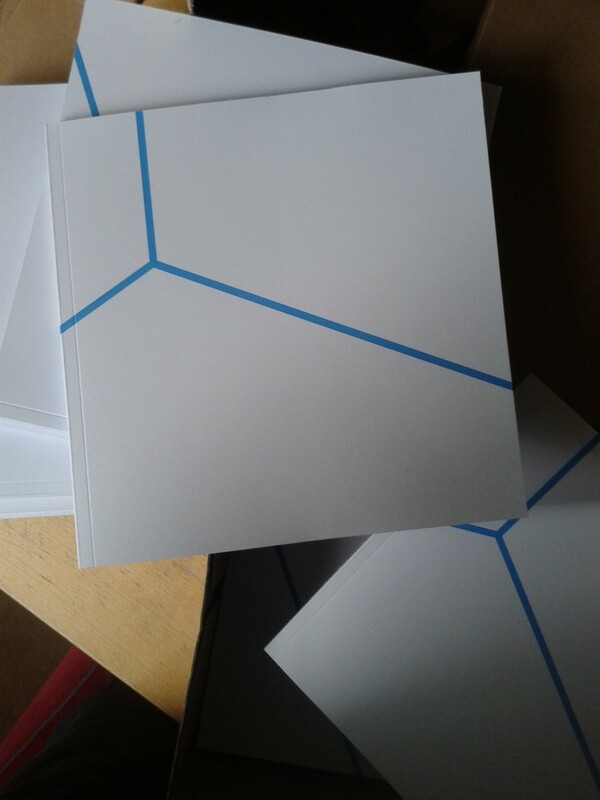 It was a lot of work, but the book feels good in hands and contains not only documentation from the actual exhibition and performances in public space and at many off spaces in Bochum, but also additional reflective texts by authors as Eduardo da Conceicao, Vanessa Joan Müller, Georg Mallitz, Tobias Prinz and an interview amongst participants. Thank you thank you to all who helped a lot and a long time – first and foremost Sandra and Ecki for their massive input. 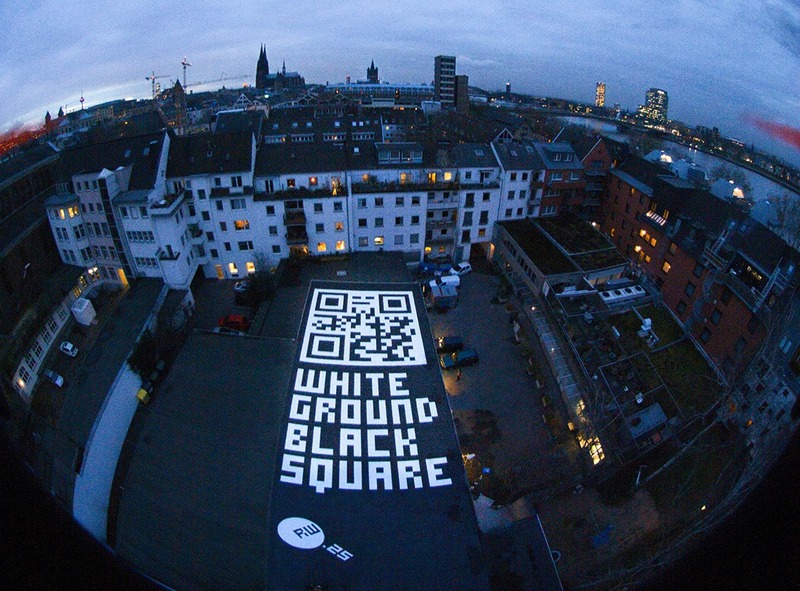 and it’s on.. the 25th roof of REMOTEWORDS, a project by Achim Mohné and Uta Kopp I could assist the past weeks, officially was opened during the 25 years ceremony of the KHM Cologne. This one sais ‚WHITE GROUND BLACK SQUARE‘ referring to Malewitsch‘ 1915 work, that also served as a base for the KHM Logo Design 25 years ago. 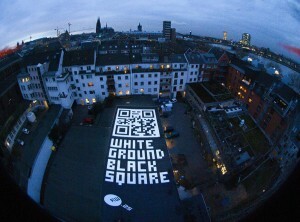 By scanning the (actually 121m² big) QR Code, flying-byers are directed to the website of the Academy of Media Arts Cologne. A well written text about pixels and analog hacking is published in the KHM Journal N°2, btw. And once again, I love working for dancers… TanzFaktur sends me to the Draamamaa Showcase to have a look for some Estonian Dance Productions. Talliin, here we go! And let’s see if we can take some bits of your dance scene home to Cologne. Harrow Den Bosch – It’s only been three years and I’ll go back to my academy! The AKV St Joost invited Ilse van Loon and me to hold a two days workshop seminar with all BA graduates of Fine Arts. Together we’ll end the session by recording interwievs with every student for a digital catalogue being presented at the Eindexamensexpositie. Very nice – looking forward to young artists and lots of questions.